It's dark, and the flames from the campfire are causing shadows to bounce off the trees. An owl hoots. A twig snaps. Someone leans in and whispers, "Have you heard the story about the Midnight Murderer who lives in these very woods?" Halloween isn't the only time people tell scary stories. 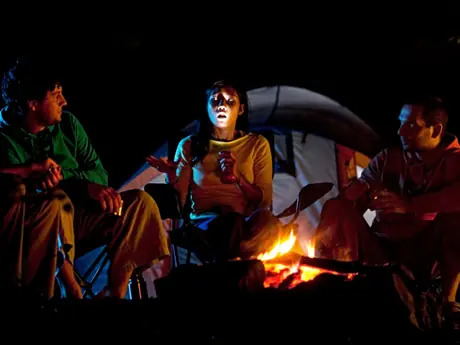 Camping and campfires invite storytelling any time of year. "People have been sitting around campfires and telling stories for hundreds of thousands of years," says storyteller Brian Rohr. "It's one of the oldest acts that humans do." Rohr, who practices the art of performative mythology and storytelling, explains that in folklore, fire is referred to as "Grandfather Fire" and Grandfather Fire is the carrier of all the stories. So it makes sense that we are inclined to tell stories while sitting around the one that carries them. Stories themselves are designed to bring their listeners into another place and time—one where people let go of structure and even rational thought. Campfires help us get to that mythical place. They invite us into another realm and help set the stage for a good story. Your storyteller continues: "His name was Jack but they call him the Midnight Murderer. He walks with a limp and has wild eyes. They say he was raised by wolves." Are you sitting on the edge of your seat yet, looking into the dark woods for strange forms among the trees? The truth is you've probably heard some version of this story before. So what makes it scary this time around? The best part of a good story is not the storyline; the magic lies in how well the story is told. A good storyteller will use his surroundings and his audience to his benefit. Here are five storytelling tips that will help your ghost stories come alive. Commit to your audience. When Rohr tells a story, he faces his audience square on and opens himself up completely to the space. This helps him gauge the audience's reactions, play off their energy, and adjust the story to the crowd. "The heart of the listener, the heart of the storyteller and the heart of the story are all informing each other," Rohr says. That's what creates the magic. Michelle Valenti is the senior editor at ReserveAmerica.com. When she's not at work, you can find her climbing rocks, riding trails, and setting up camp in fun outdoor locations around the U.S. Follow her on Google+.